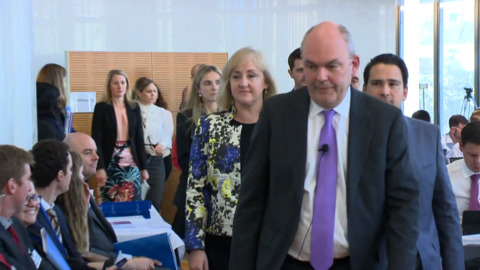 Five politicians are now contesting taking over National's leadership, with Steven Joyce announcing this morning that he too has thrown in name in the hat. Come Friday at Waitangi the Prime Minister will meet with the Iwi Chairs Forum, as well as Māori Development Minister Nanaia Mahuta, who last year made comments that the group wasn't doing its job properly. Our Rereātea Online News Team brings you a breakdown of the latest news of the day, live from the Māori Television newsroom. After nine years in government, the National Party will now be pushed back to the Opposition benches. Outgoing Prime Minister Bill English expressed his disappointment last night following Winston Peters' long-awaited decision. He also took time to thank his party and family and pay respect to the Labour leader. Outgoing Prime Minister Bill English expressed his disappointment following Winston Peters' announcement this evening. Bill English says he's pleased with their policy negotiations and like everyone else looks forward to hearing Winston Peters decision this afternoon. Following the caucus meeting in Parliament, Peters said despite the delay, he has assured the country that they will definitely know the outcome this afternoon. Former politician Sandra Lee-Vercoe believes Winston Peters will lean towards a coalition with National. NZ First leader Winston Peters has spoken to the family members of those lost to the Pike River Mine incident ahead of his talks with National leader Bill English and Labour leader Jacinda Ardern. Wellington fashionista and LGBT icon Jaye Glam Morgan (Ngāti Kahungunu) gives fashion advice to the suits of Parliament. Followers and descendants of Tūhoe prophet Rua Kēnana want to revive their Israelite religion. They gathered for their last whānau hui in Rotorua, ahead of a statutory apology they will soon receive, for the illegal wrong-doings by the crown to their spiritual leader and his followers over a century ago.